“The bridge is in!” Cam came over after noon and we made Really Good Progress on the middle deck. 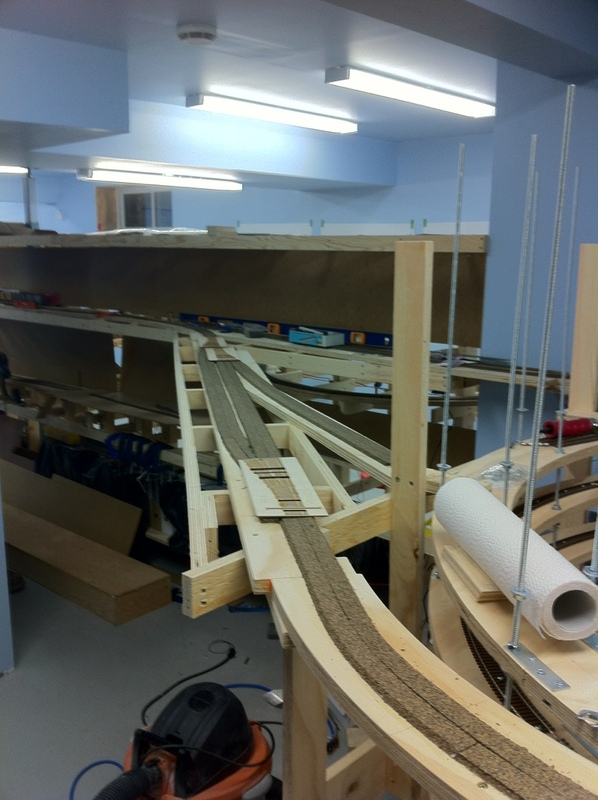 Specifically, we’ve got benchwork and cork installed to connect the Victoria sub pieces together, which when track is all laid, would connect all track laid to date. We even got things ready for the superior propane – Parksville spur in as well. This entry was posted on October 30, 2011. It was filed under Benchwork. So, if I have it right, there is track from Bryn to the Little QR bridge or so, excepting the section that is currently visually missing in the above photo? Wired ? And, the other side of the Y is laid in anyway, so if you had the section above laid down, you could shunt Parksville & fiddle at Little QR (on the lower level). That’s the FMC spur headed towards the “middle” of the photo above. 3. do the rest of life things. Is the plan to go towards Naniamo next, or continue up the spiral towards Port Alberni? The little QR bridge has actually been eliminated from the plan, anything past the turnout for the ballast spur is pretty invisible owing to the upper deck. So far, we have track in and mostly all wired up from south of Bryn through to beyond Mud Bay with the obvious exception of the track which does need to be laid and wired in. So yes, we could have a minimal switching thing going on with the unloading ramp, national silicates, Parksville team track, and Superior Propane in Parksville all being valid industries to switch. We could add in the Parksville yard as an unloading track too. After this, likely more work in the main helix to go up to the summit of the port sub, work on the victoria sub towards the Trent river bridge, and hopefully will have enough funds to start in on the shelf standards and brackets for the walls to start holding track.